Gold Resource Corporation (GRC) understands and embraces the social responsibilities that come with operating a progressive mining company, and management is committed to exemplary corporate citizenship within the communities in which it operates. Gold Resource Corporation operates in Mexico through two wholly owned Mexican subsidiaries; Golden Trump Resources S.A. de C.V. and Don David S.A. de C.V.. As the Company's Mexican operations evolve, GRC will focus on both engaging the local workforce and on promoting economic sectors beyond GRC's specific operations. Presently, GRC is involved in supporting the development of one of the area's premier natural attractions: the Natural Springs and Travertine Deposits of Salina Blanca. The objective is to help the local communities create a sustainable economic resource: tourism. Additionally, GRC is working on establishment of community recycling programs and is assisting with local road improvements. During Christmas, the Company donates to local Ejido (agrarian communities) so no child is left without a present. GRC also assists in meeting the area's health needs, and compensates a local dentist for providing free community oral health services. GRC's goal is to help create actual social and economic benefits and improve the overall standard of living for the communities in which it operates. As GRC moves further toward mine development, its contributions and work with the community will increase as well. 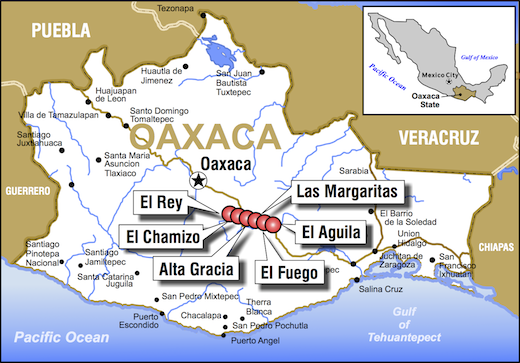 Gold Resource Corporation has consolidated six properties in the state of Oaxaca, Mexico, and has selected these properties based on their potential to meet the Company's objectives of low operating costs and potential for high returns-on-capital. GRC currently controls over 684 square kilometers, including 55 kilometers of a geologically important structural fault corridor running North 70 West. GRC has 100% interest in all of its properties. The Company's flagship project is the El Aguila Project, where the Arista underground polymetallic deposit is currently in production. The Arista deposit produces gold and silver, as well as the base metals copper, lead and zinc. The Company's additional five exploration properties are within trucking distance of the El Aguila Project's processing facilities, potentially reducing the capital required to put any future deposit discoveries into production.